We begin this week's story on January twentieth, nineteen sixty-one, the day John Fitzgerald Kennedy became president of the United States. It had snowed heavily the night before. Few cars were in the streets of Washington. Both Eisenhower and Kennedy served in World War Two. Eisenhower had been commander of allied forces in Europe. Kennedy had been a young Navy officer in the Pacific. He came from a politically influential family from Boston, Massachusetts, but he was a fresh face in national politics. To millions of Americans, he represented a chance for a new beginning. Not everyone liked him, however. Many people thought he was too young to be president. Others did not like the idea of electing the nation's first Roman Catholic president. Eisenhower's vice president, Richard Nixon, ran against Kennedy in the election of nineteen sixty. Many people believed Nixon was a stronger opponent of communism than Kennedy. The election of nineteen-sixty was one of the closest in American history. Kennedy defeated Nixon by fewer than one hundred twenty thousand votes. Now, on the steps of the Capitol building, he would be sworn-in as the nation's thirty-fifth president. One of the speakers at the inauguration was the eighty-six-year-old poet Robert Frost. The wind was blowing the paper in his hands and the sun was shining off the snow on the ground and into his eyes. Kennedy stood to help him. But the famous poet was unable to read much of the poem he had written specially for the ceremony. Instead, he began another one that he knew from memory. Here is a studio recording of Robert Frost reading his poem "The Gift Outright." ROBERT FROST: The land was ours before we were the land's. Soon it was time for the new president to speak. He was not wearing a winter coat or a hat, unlike many of the people around him. One of the issues that Kennedy talked about was the danger of what he called "the deadly atom." He was taking office during the Cold War between the United States and the Soviet Union. Both sides had atomic bombs. People worried that there could a World War Three that would end in nuclear destruction. Kennedy said both sides should make serious proposals for the inspection and control of nuclear weapons. He said they should explore the good in science, instead of the terrors. 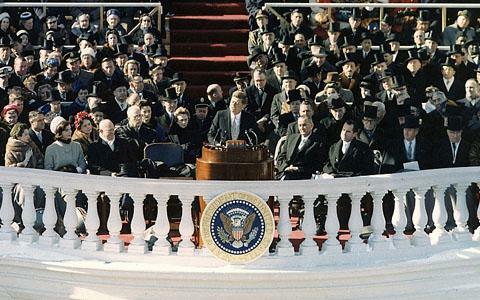 JOHN KENNEDY: "Together let us explore the stars, conquer the deserts, eradicate disease, tap the ocean depths, and encourage the arts and commerce ... Let both sides join in creating a new endeavor, not a new balance of power, but a new world of law, where the strong are just and the weak secure and the peace preserved." Kennedy also spoke about a torch of leadership being passed to a new generation of Americans. He urged young people to take the torch and accept responsibility for the future. He also urged other countries to work with the United States to create a better world. John Kennedy was in office less than two weeks when the Soviet Union released two American airmen. The Soviets had shot down their spy plane over the Bering Sea. About sixty million people watched as Kennedy announced the airmen's release. It was the first presidential news conference broadcast live on television in the United States. Kennedy welcomed the release as a step toward better relations with the Soviet Union. A few weeks later, President Kennedy announced the creation of the Peace Corps. He had spoken about his idea during the election campaign. The Peace Corps would send thousands of Americans to developing countries to teach and provide technical assistance. Soon after the Peace Corps was created, another program was announced. The purpose of the Alliance for Progress was to provide economic aid for ten years to nations in Latin America. Another thing that Kennedy had talked about during the election campaign was the space program. He believed the United States should continue to explore outer space. The Soviet Union had gotten there first. It launched the world's first satellite in nineteen fifty-seven. Then, in April nineteen sixty-one, the Soviet Union sent the first manned spacecraft into orbit around earth. That same month, the new American president suffered a foreign policy failure. On April seventeenth, more than one thousand Cuban exiles landed on a beach in western Cuba. They had received training and equipment from the United States Central Intelligence Agency. They were supposed to lead a revolution to overthrow the communist government of Fidel Castro. The place where they landed was Bahia de Cochinos -- the Bay of Pigs. The invasion failed. Most of the exiles were killed or captured. It was not Kennedy's idea to try to start a revolution in Cuba. Officials in the last administration of Dwight Eisenhower had planned it. However, most of Kennedy's advisers supported the idea. And he approved it. In public, the president said he was responsible for the failure of the Bay of Pigs invasion. In private, he said "All my life I've known better than to depend on the experts. How could I have been so stupid." What happened in Cuba damaged John Kennedy's popularity. His next months in office would be a struggle to regain the support of the people. That will be our story next week. This was program #210. For earlier programs, type "Making of a Nation" in quotation marks in the search box at the top of the page.